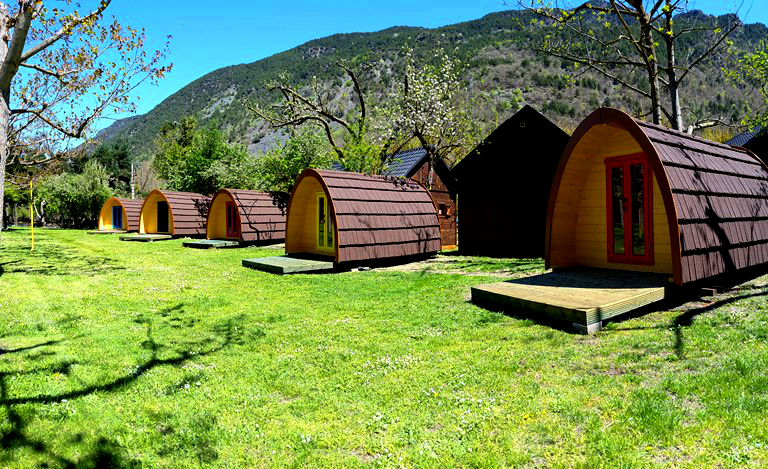 Spending your holidays in any of the accommodations of the campsite you will be able to access easily and explore areas of great beauty, amazing places with no compare, in the setting of the Pyrenees, the county of el Pallars and the valley of Vall Cardós. El Pallars Sobirà is one of the counties with most protected areas. In fact, it has the only National Park in Catalonia, Aigüestortes and Sant Maurici lake National Park, only 27 kilòmetres from Càmping del Cardós. There is also the Alt Pirineu Natural Park, he boundary for all the villages in our valley.Several areas of the PEIN (Pla d’Espais d’Interès Natural de Catalunya- Natural Interest Landscape Plan of Catalonia) and the Hunting Reserve of Boumort are here, too. Here is the largest lake in the Pyrenees, Certascan, and the highest peak of the country: Pica d’Estats. It is an itinerary on foot, starting at the campsite and available for all the family. The route is approximately 9 kilometres long and can be completed in three hours. With it you will enjoy the walk and discover a jewel of Romanesque art that we have in the valley: the medieval bridges. Take pleasure in all the villages you will walk through along the river: Ribera, Cassibrós, Ainet de Cardós, Lladrós and Lladorre. One of the most captivating features for the visitor arriving to the Vall de Cardós is the majestic peak of Pui Tavaca; although it is only 1.718m, it has a daring stance with its pyramid shape, challenging those at the bottom of the valley to come closer. From Càmping Cardós you can access the peak choosing from a variety of options depending on the difficulty, duration and components of the excursion. Less difficult is the access to Pui Tabaca from the village of Lladrós, through an old forest ride, that zigzags to the foot of the mountain. For the most adventurous ones, there is a route taking you to the summit through a less marked itinerary, from the village of Bonestarre. Two options that will doubtlessly take you to the spot with the most privileged and amazing views of the valley. Hidden next to Vall Cardós, there is a little valley which in old times was named “lo Vallat”, with the hamlets of Surri, Bonestarre , Anàs and Estaon. These are tiny villages that, with the passing of time, still keep the charm of the Pyrenean villages, enclosed by mountains, with the typical Pyrenean “black” architecture and its beautiful churches, where to walk around enjoying the most unimaginable quietness. From the hamlet of Estaon itself, you can follow the GR11, which will take you, among other routes, to the group of the old “bordes” in Nibrós, Clavillans and Perafita, some spots really worth exploring. Follow a small path, and all the family will be able to keep up with no difficulties on an excursion to discover another part of the Pallaresan Pyrenees. One of the main features of the Pyrenean Valleys are the lakes at the tops of the towering mountains, normally difficult to access due to its location, at a high point, and with long and complex itineraries. If you do not wish to leave the Pyrenees without having seen some lakes, you may visit the lakes at Estanys del Port; To access them, go to Tavascan (12 km. from the campsite) and then to Cuanca towards Pleta Palomera. There is not one spot to be missed, because it is quite an Alpine area, with rivers, forests and magnificent mountains. From the second lake you will be able to see the Port, a mountain pass that physically separate us from our neighbouring country, France. Completing part of the above itinerary, leaving the car at Cuanca or at Bordes de Graus, you can walk with all the family in an excursion that will be up to your expectations …these bordes are only 45 minutes away from where you left the car, enclosed in a wonderful landscape, at the foot of these huge mountains which will transport you to the past, to the time shepherds and their flocks spend most of the year there, between mountain pastures and fields. You can access this incredible spot on a four-wheel drive or a high car, because the access is not difficult but it is still a forest ride. It is really an captivating spot because after climbing for a while, we will reach a plain, a huge field of Alpine pastures surrounded by hundred year old pine trees, with rather whimsical shapes. The plain is an incredible natural viewpoint, with views overlooking the valleys of Cardos and Vall Farrera. We specially recommend this route starting from the campsite for mountain bike lovers as well as for those who like descents, because there is an itinerary with signs inside the forest. In general, we most heartedly invite you to visit the, Vall Ferrera, because it is one of the most beautiful valleys in El Pallars Sobirà. In particular, as a starting point for many excursions which we recommend in this section you can visit the village of Àreu, 1.220m high, surrounded by fields and mountains, a point of access to Alpine landscapes we are describing next. From the village, you can take the forest ride, which should be done best on a four-wheel drive car, leading to ” la Farga”, the first car park; from there, reach Plà de la Selva, where to enjoy the gigantic fir tree forests and pastures. Starting there, there are some itineraries on foot, or also get to Plà de la Selva from the car park of la Farga, on foot ( 1h 30m. approx. ), following the Gr 11. If you go on four-wheel drive or follow Gr 11 on foot from the car park of la Molinassa, ( 1h 30 m. approx.) you can reach Plà de Boet, an amazing setting with its Alpine features: pastures, waterfalls surrounded by forests and with continuing excursions to the lakes of Baiau, or to Port de Boet, the natural border with Andorra. This is undoubtedly one of the most “traditional” routes in the area for those who own a four-wheel drive car and wish to get to Andorra. However, this route is much more than only a way of getting there without driving all the way through the mountain pass of Port del Cantó, and avoiding the queues to access the neighbouring country. Reaching Andorra driving through Tor means enjoying wonderful landscapes, with green thick forests, rambling herds, following the wild river along the way, discovering the mysterious village of Tor, where to stop for a drink or a snack at Pili’s and visit a village that remains as an example of a Pyrenean hamlet with hardly any modifications; or, if the weather allows, go mushroom picking. The route you will follow was an old smuggling path, which was taken during the night, some times packed with snow and others without. Along the route, smugglers crossed it loaded with tobacco, alcohol and other valuable goods. To go on this excursion you must leave the campsite by car and drive towards the valleys of Àneu, specifically to la Guingueta d’Àneu, where you will find the access point. Go halfway round the dam of La Torrassa, which is the main point of the excursion. From there, you can walk on or take the bike along the path that surrounds the dam. SWe highly recommend this excursion for two reasons; the first and most important, all the family can do the walk, the little ones and the older ones too, even with a baby seat on your bike since the path is almost completely flat, unpaved and with no rocks, allowing for an excellent bike ride. There is no traffic allowed for motor vehicles. And lastly, you will enjoy a special area natural interest, La Mollera, a habitat next to the dam, with reeds and other typical vegetation, as well as characteristic fauna, such as ducks. If you continue, the path will take you almost to Esterri d’Àneu, which will end up being quite a nice long walk. As everybody knows, this is the only National Park in Catalonia, and it is incredibly close to our campsite (25 minutes by car), so it is a visit you cannot miss. high mountain surrounding, full of lakes and rivers, and with an exceptional flora and fauna, typically characteristic of our valleys and of its habitat. You must get to the entrance of the Park that is in our side of the county, in the village of Espot. From there, access the park on foot or take a taxi from the service at the entrance of the village of Espot.